Garmin GPSMAP 62st handheld GPS system is designed for walking and hiking, however with its SD card slot you can also load additional maps making it ideal for use on a bike, on a boat and in a car too. Preprogrammed with European topographical maps, the 62st also features a 2.6-inch sunlight-readable colour screen, is waterproof and can be powered via either AA or lithium-ion batteries, providing power for up to 20 hours. The Garmin GPSMAP 62st outdoor device also features an electronic compass and barometric altimeter. 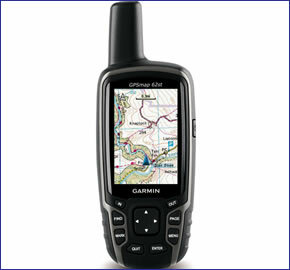 The equivalent and replacement model is the Garmin GPSMAP 64st. You can however still buy accessories for the GPSMAP 62st. The Garmin GPSMAP 62st is a high-performing GPS handheld device - perfect for demanding outdoor adventures. With its protruding GPS receiver on top of the 62st it'll maintain a GPS satellite fix longer than other handheld GPS devices (with a built-in GPS antenna), when used in areas of poor or low GPS reception e.g. deep valleys, woodlands. Coupled with this the GPSMAP 62st is also waterproof and provides up to 20 hours battery life. Please note: The GPSMAP 62-series supersedes the now discontinued GPSMAP 60-series, however accessories and maps are still available. The GPSMAP 62st features a built-in 3-axis tilt-compensated electronic compass, a barometric altimeter and wireless connectivity with other compatible Garmin handheld devices. Enabling you to wirelessly share geocaches waypoints, tracks and routes. Plus with its internal 3.5GB memory you can store up to 2000 waypoints, 200 routes and 10,000 points on 200 saved tracks. Preloaded to the premium GPSMAP 62st memory are topo maps for Europe. Topo or topographical maps provide rich map data with contours, elevation, roads and rivers, etc. The scale of these pre-installed topo maps is 1:100k. Additional mapping such as Garmin GB Discoverer maps are also available for use with the GPSMAP 62stc. These maps are sold separately on SD/microSD Card from ActiveGPS and once installed provide Ordnance Survey (OS) LandRanger maps at at a scale of either 1:25k or 1:50k depending on the map purchased. To view the different maps that are available for the GPSMAP 62stc click here. Please note: You can ONLY view one map at anyone time e.g. Topo or GB Discoverer. If you are using solely in the UK and would prefer the coverage and detail that GB Discoverer (OS) maps provide, you could consider buying the GPSMAP 62sc and then purchase a GB Discoverer SD/microSD Card for the region/area of your choice. The Garmin GPSMAP 62st supports paperless geocaching using GPX files making this an ideal handheld GPS system for geocaching. It will download coordinates of the geocache as well as the location, terrain, difficulty, hints and description. This saves you printing out the geocache details and carrying them around with you - just download to the Garmin GPSMAP device and go. If you want a 5 megapixel digital camera built-in you should consider buying the Garmin GPSMAP 62stc instead. The 62stc which like the 62st includes the same preloaded topo maps, enables you to take photos and automatically geotags them with the GPS co-ordinates of where they were taken. This enables you to view and navigate back to exact the location too. Do you have a question about the Garmin GPSMAP 62st or other handheld GPS related question that's not been answered on this webpage? Please see our handheld and Outdoor GPS FAQs page for questions from other customers.Plus if the answer to your question isn't featured, use the online form to ask us for the answer. Alternatively please telephone 01733 777623 Monday to Friday (9:30am-5:00pm) to speak to one of our sales team. For further information online please see the Garmin GPSMAP comparison table. Garmin GPSMAP 62st is preloaded with a worldwide basemap with shaded relief and topographic maps for Europe. Please note: Additional maps can be loaded to the GPSMAP 62st. The GPSMAP 62st features a SD/microSD Card slot, an easy way to add new maps and mapping updates. Looking for accessories to use with the Garmin GPSMAP 62st handheld device? We sell a vast selection of genuine parts and spares including GPSMAP 62st slip case, retractable lanyard, carabiner clip, battery charger, bike/handlebar mount, Garmin Tempe and chirp Geocaching Beacon. Garmin GPSMAP 62st is preloaded with a Worldwide basemap with shaded relief. However, a number of other maps supplied on SD/microSD Card are also compatible including street-level road maps - perfect for cycling of using your GPSMAP 62st in a car, 1:50k and 1:25k Ordnance Survey maps - ideal for hiking and walking the countryside of Great Britain and marine BlueCharts - ideal if you want to navigate the waters around the UK, Europe or further afield.